Cloud storage offers many cost-effective ways to store, share and archive your healthcare organization’s most important medical records. Cloud storage offers many cost-effective ways to store, share and archive your healthcare organization’s most important medical records. Though it’s an easy way to get the flexibility and scalability you need, many are wondering if the Cloud is safe enough for the healthcare industry. With privacy and security concerns at an all-time high, there’s every reason to get all the facts before moving forward, especially if you have to meet HIPAA compliance rules. Before you decide on a cloud provider, consider this: Your organization can save time, money and ensure the security you need by working with a HIPAA-Compliant Cloud Provider. Your staff can get more done in less time each day, and that’s a win for everyone. The Cloud is a shared resource containing a suite of web-based products, tools and services that can be configured and deployed without a lot of effort. Cloud computing solutions come in three forms: public, private and hybrid. And all three provide the same level (or better) service than using onsite services, but at significantly lower costs. Without the Cloud, you’ll need to purchase all the necessary tools to manage your IT systems. By using cloud services, you only pay for what you use (applications, storage, infrastructure services, etc.). Plus, you need both onsite and offsite cloud-based file backups to protect your critical data. One malware or ransomware infection could cost you thousands of dollars and become a major interruption in the way you do business–not to mention the possibility of a data breach where you’ll be listed on the HHS Wall of Shame. Scale resources up or down as needed. Have secure anytime, anywhere access to applications and resources so you and your authorized staff can use your practice management and other solutions when you’re out of the office. Reduce the total deployment time of rolling out new applications. Never have to worry about management or maintenance: Your cloud is always being monitored for security risks, for efficiency and all types of issues that can crop up out of nowhere. Ensure Business Continuity: Don’t let a natural or manmade disaster shut your practice down. Increase Collaboration: Work with your team at the office or on the road. Secure Critical Files: Don’t be the victim of ransomware or a malware virus. Get layered security via the Cloud to safely store and protect all your data. Improve Communication: Stay in touch with your teams no matter where you go. Increase Productivity and Efficiency: Get more from every employee each day. Increase Compliance: The Cloud greatly simplifies compliance issues. Benefit from Flexible Pricing: All facets of your practice’s technology infrastructure can be addressed for a single monthly fee. You can take advantage of bundled packages that include anything and everything from your phone system, cabling, data network, help desk, wireless and other IT infrastructure needs. Have ready access to the latest software: In a cloud environment, community-driven APIs are often available for automatic scaling, provisioning and management. In a dedicated environment, you may have to wait for vendor-driven development. 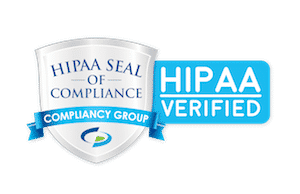 How Do You Find The Right HIPAA-Compliant Cloud Provider? Data backups – Data backups are essential. They must be performed at least daily, and they must be tested to ensure they’ll work if needed. Make sure your cloud provider offers the level of redundancy that your practice needs. Also consider an on-site storage option for additional protection. Encryption – Encryption is most likely the way of the future. Even if cyber thieves steal your data, they won’t be able to decipher it without the encryption keys. This adds a strong layer of data protection and reduces the likelihood that your organization will be a victim of cybercrime. Access Monitoring – All cloud providers have stepped up their game with access monitoring and other tools to keep the bad guys out of your network. It’s important to have Intrusion Detection Systems, along with robust Firewalls. Your cloud provider should send regular reports that show your system is working properly, indicate if there were any problems, and, if so, how they were handled. Contracts & Agreements – Service Level Agreements are now required by most cloud providers. These outline what your service provider will do, as well as what their responsibilities are when it comes to service disruptions. You need clear wording in your SLA that describes how they will handle confidential records as well. Make sure you understand exactly what your cloud provider is responsible for. One final note: Avoid working with service providers who are unclear about exactly what services they provide and the cost for this. Any reputable managed IT services company should be able to answer all your questions to your satisfaction. This can prevent you from getting involved with a company that may not offer the high level of services that healthcare organizations require. To learn more about the benefits of cloud storage for your clinic or medical practice, contact Veltec Networks. Our specialists can help install everything and safely migrate your data to a new and reliable cloud storage solution. Contact us for a complimentary IT assessment and for the HIPAA-Compliant Cloud Provider you need.